Home > Uncategorized > 2 Calicos, 1 Big Hike Done! 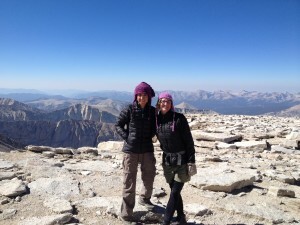 Theresa and Rachel are happy to report that as scheduled we arrived safely on Friday, September 12 at 5 pm at Whitney Portal completing our 17 day, 230 mile trek that included the whole John Muir Trail and a climb up Half Dome. Mel and Anita traveled safely to California to be part of the ending party which led into a celebration of Mel’s 90th birthday on Wednesday, September 17. We thank everyone who gave generously for Charcot Marie Tooth research in honor of our trek and in celebration of Mel’s 90th birthday. It is not too late to donate to “Doing Muir” if it fell off the to-do list, at CMTAUSA.org/url/DoingMuir. It was exciting to hear that CMTA just announced the formation of an alliance with the company Genzyme to identify small molecule candidate therapies for CMT1A, which can lead to clinical testing and patient trials. We thank all of our family and friends for all their words of support and encouragement as we embarked on this slightly insane hiking adventure. It certainly took a village! A special thanks to Kay and Peter Nevin for renting a cabin at Red’s Meadow. It was very exciting to see them hiking towards us as scheduled on the fifth day. We had a relaxing afternoon of showers, laundry and dinner at the Mammoth Tavern. A thanks to our neighbors Ethelann Dickey for having Mel and Anita to lunch on the day before the drive to Lone Pine and Desiree Deasy for running errands on their behalf. Morgan Hall for providing us with a Spot Connect which gave peace of mind to many. And last but certainly not least, a very special thanks to Darrell and Jim for putting up with, and encouraging the “Summer of Muir”. We could not have done it without you and are happy to report that we are coming out of what we have now realized was “The Muir Trance”.